Journal of Orthopaedics aims to be a leading journal in orthopaedics and contribute towards the improvement of quality of orthopedic health care. 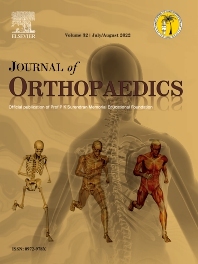 The journal publishes original research work and review articles related to different aspects of orthopaedics including Arthroplasty, Arthroscopy, Sports Medicine, Trauma, Spine and Spinal deformities, Pediatric orthopaedics, limb reconstruction procedures, hand surgery, and orthopaedic oncology. It also publishes articles on continuing education, health-related information, case reports and letters to the editor. It is requested to note that the journal has an international readership and all submissions should be aimed at specifying something about the setting in which the work was conducted. Authors must also provide any specific reasons for the research and also provide an elaborate description of the results. We also provide many author benefits, such as free PDFs, a liberal copyright policy, special discounts on Elsevier publications and much more. Please click here for more information on our author services.Please see our Guide for Authors for information on article submission. If you require any further information or help, please visit our support pages:http://help.elsevier.com/app/answers/list/p/8045.